Postcard with original architectural rendering for the building. 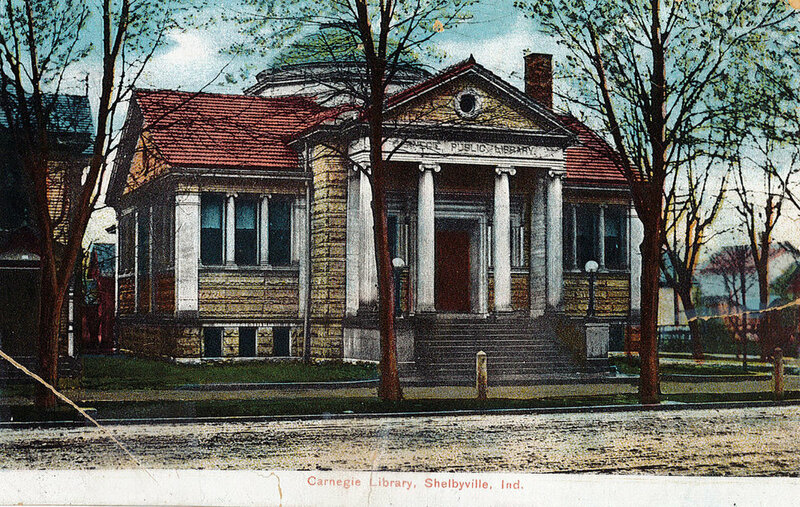 In November 1897, the Shelbyville Community High School hosted the county's first public library devoting 1,000 volumes and two rooms to a collection. 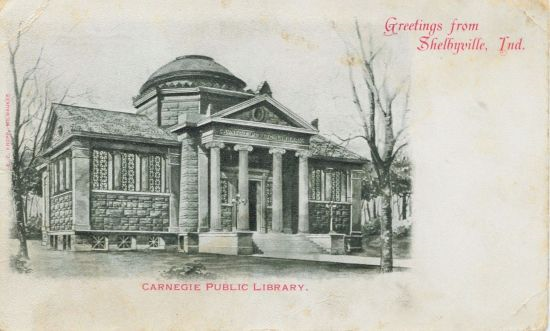 In an attempt to expand the library services and fund a separate library building, school trustees applied for a $20,000 grant in 1901 from Andrew Carnegie. 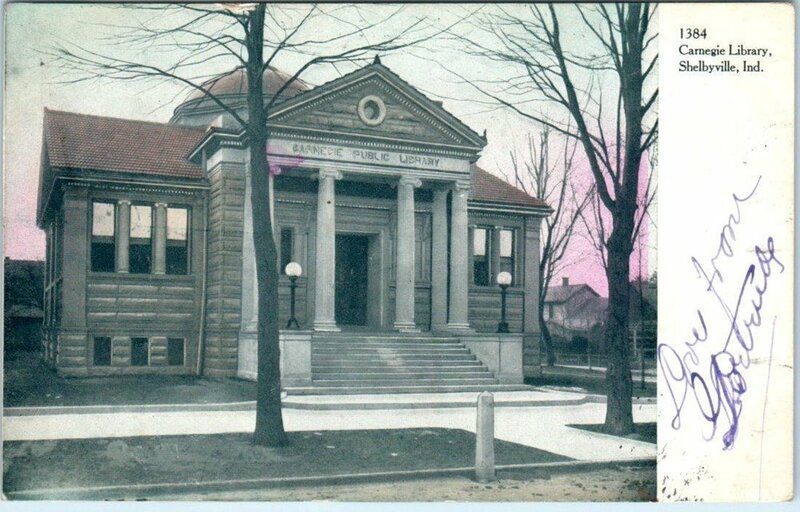 The money requested was approved and construction was completed on June 2, 1903. This building served until 1966 when the children's room and elevator were added. County Contractual Library Service started in 1967 and the Mobile Library began driving books to those outside the city in 1968. This service continued until 2015. In 1975, the library district expanded to include all of Shelby County, and in 1985, property adjacent to the library was purchased to begin a building project. The firm, Bohlen, Meyer, Gibson, and Associate were chosen in 1991 to begin the building project's work. Ground breaking for the expansion took place in 1993 and was finished in 1994. Renovation of the Carnegie building was completed in early 1995. Space was rented from the Town Hall for the Genealogy and History Room in 1998. The library continues to accommodate for growth. In the last ten years, three homes behind the library were demolished to provide for additional parking; one home was converted into a Genealogy and History House. In 2007, the Keifer building adjacent to the library was purchased. After demolition was considered, plans to renovate the 1887 structure were drafted in 2008. Renovation began in July 2009 and will be completed in 2018 with the help of a $2,000,000 General Obligation Bond issued in 2017. The bond also is covering expenses for the following: replacement of the roof including the copper on the dome which is over 100 years old, new HVAC system in the main library, and back parking lot renovations. In 2017, the library was awarded a $150,000 Blue River Community Foundation's Ignite Grant for the installation of a community plaza between the main library and annex. These recent renovations and construction is expected to be complete in 2018. The library's branch in Morristown first opened in Morristown High School in 2012 and then moved to the Town Hall in 2013. After growing out of that location, the library was moved into the old Shelby County Bank in 2014 and named after Velma Wortman, the first high school librarian at Morristown High School. 2016 architectural renderings for updates to the Shelby County Public Library property.